Is it possible to fly a paramotor on a budget? I've spoken about my bad experience with buying cheap kit a few times, so you need to be very careful, but it's definitely possible. It's quite upsetting that many people are held back because of the expense of paramotoring. A few days back I looked at a paramotoring survey that was conducted on Facebook and Reddit. The survey found that the average age of paramotor pilots was 43 years old. There's nothing wrong with that, but over the years I've only met a handful of pilots that are younger than me (I'm 34, started flying at 28). This tells me that it's either a case of midlife crisis that's attracting pilots to the sport, or the expense that is keeping younger pilots away. I'm willing to bet that in large; it's more of a money issue! So in this post we'll find out how to buy your equipment on a budget. We'll look at all of your options, what to look for, where to look for budget kit, the things you need, and the things to avoid. Long story short, he flew into a tree on his second flight. He walked away from the crash, but this was followed by a bunch of bad decisions and further small crashes. 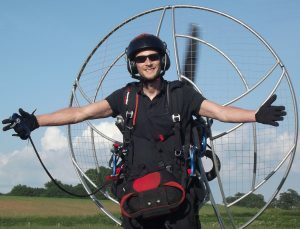 He no longer flies because he broke his bank repairing his paramotor, he left the sport saying it costs too much! Just like my friend found out, paramotoring can go wrong very fast if you skip the training. I'd say he actually got very lucky, as I've heard of people who bust themselves up bad after self-training. There's a lot more to training than just strapping in and having an instructor guide you through your flight. There are certain steps you need to go through before you're ready to fly, and for this reason self-training is not recommended. But training is so expensive! Training isn't cheap and spending £1000 / $1500 in one chunk can be hard for some people. Although many training schools won't say it on their websites, most of them will offer single day training. This is usually an option for pilots who can't get time off work to do 7 days straight. It's also a great option for people who can't afford to pay out such a large sum of money in one go. I'd still recommend saving up and doing it all in one go so everything is still fresh in your mind on each new morning of training. If there's big month long gaps you'll likely get rusty, and you could end up spending more in the long run. But if this is the only way you can do it then the option is there. "You can skimp on a lot of things, but don't skimp on the training"
Never buy a paramotor or wing until you have completed your training. You can learn all about the mistake I made buying my first budget equipment before training HERE. 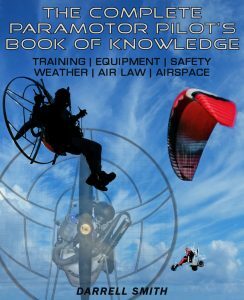 During training you'll learn all about what to look for in a paramotor, so you'll know exactly what you need. For a head start, you can learn the various things you need to look for in a paramotor HERE. If you're looking for a cheap paramotor I'd advise you to choose a good trusted make, and buy second hand. As soon as a paramotor is purchased it looses value, find one with 50 hours running time and you can knock £2000 of the new price. Buy the newest technology as possible, because manufacturers didn't consider things like torque and thrust effects on older paramotors. 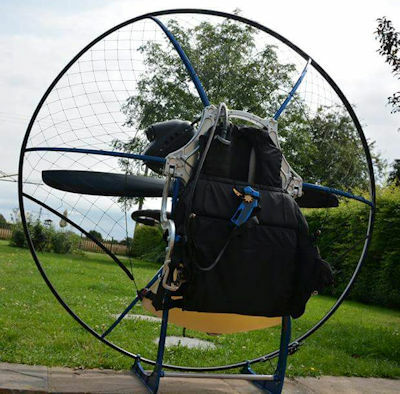 Old paramotors can suffer with severe torque twist, which is reduced by different placement of the hang points on newer paramotors. And thrust induced pivoting around the hang points, this happens when the thrust line is too far above or below the hang points. You can find used paramotors on sites like eBay, or on selling pages on Facebook here and here. Never buy blind on these groups or on eBay, as pictures and sellers descriptions can only tell you so much. And from my experience sellers will usually make it sound better than it really is. 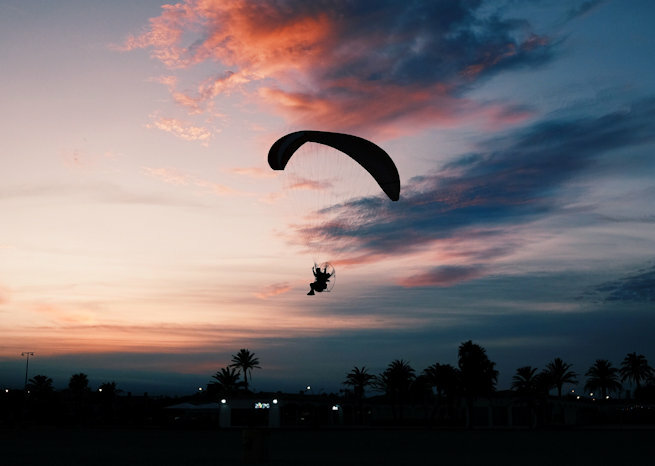 Always go and take a look at the paramotor for a better view of what you're spending your hard earned cash on. Pilots want to sell their used paramotors as easily as possible, so they'll likely tell a few porkies when advertising them. If somebody tells you the paramotor only has 10 hours flight time; don't believe them. This could be true, but if you believe the person you may end up skipping certain parts of the inspection. Treat the paramotor as if it's flown for 500 hours and check everything. Check the harness for wear, and inspect the attachment points. Check the clips and buckles by clipping in and pulling on them to make sure they don't come apart. Leg straps are super important, so be sure they are in perfect condition, with good solid quick lock buckles. Many harnesses have back-up straps that keep you safe in the event of a swing arm failure, so check all back-up straps. And don't forget to check that the seat board inside of the harness is in good shape. For me a strong frame is important, no matter how experienced you are it's always possible to slip and fall. A weak frame can easily bend when impacting the floor. Check all welds and stress points, and look all over the frame for cracks. Look across the frame tubing for bends or kinks, and if the cage is attached remove it. Once the cage is removed put it back on, if this seems difficult and holes don't line up it could be an indication of a bent frame or cage. Check the cage netting, older netting had fairly large gaps which can be dangerous. Hands have gone through into the propellers, and so have brake handles! If the netting has large gaps bare in mind that you'll need to fit new netting to stay safe. Check all fixing points and look closely at the swing arms, and carabiners checking them for cracks. Carabiners can be replaced, but bare in mind a good pair will cost about £40 / $50, so negotiate the price accordingly. Check the nylon webbing for wear, and ensure the point that fixes the webbing to the swing arm is in good order. Check the propeller for scuffs or chips, just a small ding can put the propeller out of balance. An un-balanced prop will cause serious vibration in flight which can cause damage and loosen bolts. I found out how easily vibrations can loosen bolts on my current motor. You can read about what happened in this post. If the propeller is damaged bare in mind the cost of repairs, or the cost of a new propeller, which isn't cheap. Check the engine mounts and the engine plate that attaches to the frame. If the engine is a pull start you can take the plug cap off and pull on the chord to check the compression. You can also listen for anything that doesn't sound right as you do this, like grinding or crunching noises etc. Small amounts of oil around the intake, air-box, or dripping from the exhaust are normal on a two stroke engine. But check around the base of the cylinder and the cylinder head for signs of oil or soot. This will indicate blown gaskets that need replacing. Check that the throttle pulls smoothly, and that the lever returns to the stop on the hand lever side, and the carburettor side. If it doesn't then don't attempt to start the engine under any circumstances. Find out why, and how to start the motor HERE. When you're strapped in and the engine is running, make sure that the power delivery is smooth. Give it a good rev to check that it revs clean and that it reaches full power. Be sure to fully warm up the motor before you stop it... I've had two strokes that run great cold, but cut out as soon as they get warm, which can be due to electrical problems. Before buying a wing you should understand ratings and certifications, wing loading and sizing, difference between reflex and classic wings, etc. You can find all of this in my beginners guide to wings HERE. When you understand all of the above you can start looking on the sites that I mentioned earlier for a used wing. Again, don't buy blind, go and look at what you're buying or you could be disappointed when it turns up. So what do I need to look for in a used wing? 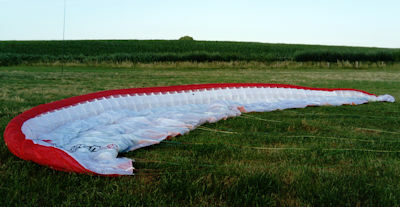 As with the paramotor, you should also look for a modern design when buying a wing. Wing design has changed enormously over the last few years, and the safety factor keeps getting better. In general, the newer the design the safer the wing is going to be. But you still need to choose the right rating for your experience... A beginner flying a modern EN-C wing could be just as dangerous as flying older technology. When buying a used wing it's important to ensure that it's had a full inspection, and that it comes with its test report. All used wings need inspecting before going to a new owner, even if they've only flown for ten hours. A porosity test - The older a wing gets, and the more use it has, the more porous it will become. A porosity test measures the void spaces in the material and the report will contain it's result in excellent, good, fair, or bad. Line check - The lines will be checked for damage that can't be seen by simply looking at the lines. They will also undergo a strength test to ensure they're still able to hold their certified weight. Full visual check - This is done to check for small holes, tears, blown stitching, broken cell stiffeners, etc. Riser check - The risers are checked for wear and tear. Maillons, which are the triangular shape rings used for attaching main lines to risers are also inspected. By buying a wing that's been inspected you'll know that it's safe, and good to fly for another 1-2 years before it needs inspecting again. The wing has its test report but you still need to give it a full visual check. So do exactly what is done during a wing inspection. Look for tears, snags and holes, check all of the stitching, and go along the leading edge checking around the cells and their stiffeners. Check the risers and the maillons, and make sure the brake handle magnets are present. Run your thumb and index finger along the lines feeling for any imperfections, this is how you check for damage or breaks. This may not always be possible, but if there's a local park or a clear bit of land then ask the seller if you can ground handle the glider. You can make sure the wing launches and flies as it should, and you can get a feel for it before making your decision. Now you've got the expensive things out of the way there's a few more bits you'll need to keep you safe. A reserve chute is essential and you should never fly without one. They can be pricey at around £500 / $650, but you can buy them second hand. If you're buying a secondhand reserve you'll need to find out the date of manufacture. Most manufacturers recommend replacing a reserve parachute after 10 years. So Beware that the secondhand prices will drop further as the reserve increases in age. Similarly to wing testing, reserve parachutes undergo a full check to ensure their safety every year. So before buying you should also make sure the chute has a test certificate, this means it's been inspected and repacked. Be sure to look at the weight range that the reserve chute is certified for. Take your weight fully geared up, plus the paramotor and wing weight to find the correct size. When buying a helmet, if you see paramotor or paragliding on the description the price will be higher. Many pilots use mountain biking helmets or even full face motorcycle helmets. I wouldn't personally recommend a full face helmet as your field of view can be blocked. I see a bunch of pilots using a helmet that you can find on Amazon HERE. Look at the related items and you'll see that it sells more to paramotorists than any other sport, plus it's cheap enough to fit any budget! Don't fly without ear protection, the sound of an engine a few inches from your ears will do permanent damage in no time. Foam earplugs are a cheap option, but if you want to add a communication system you'll have no way of doing so. So a better way of doing it is to use ear defenders that clip onto the helmet like these on Amazon > Ear Defenders. Then when you're ready you can integrate a Bluetooth communication device like the pilots favourite SENA 10R-01. There's a few more bits and bobs you'll need, like a windsock and pole, windspeed meter, etc. These are fairly cheap anyway so I won't list them here. You can find my list of 12 essential paramotoring items that you'll need to start flying > HERE. So paramotoring will never be super cheap, but it is within reach of anybody with a little saving. By setting a budget and buying secondhand you should be able to save at least £3500 / $4500. Thanks for checking out this post, good luck with finding your budget set-up! Awesome Blog! I’ve read every word and look forward to flying! The most informative out there! Thank you John, I’m glad the site has been helpful to you. See you in the air! Thank you Ray, there’s a lot more to come as I’ve got some really cool ideas. Welcome to the sport! Great web site, with a wealth of information for us “haven’t started yet” folks! I’ve seen discussions on all the different pieces and parts of the package, and obviously we can choose any wing we want. But my question is does the motor always come with its own frame, or (for example) can I buy a “Simonini” engine and attach it to a “Flat Top” cage, with a different prop? I’m sure that piecemealing it like that would be more expensive than a package deal – or is it? For instance; I like a lot of features on the “Fresh-Breeze” motor, but have heard bad things about having open netting on the cage. Plus the hole size of the netting seems too large. Your thoughts please? Most frames will let you attach your own choice of engine, but all engines are mounted differently. To make things easier, most frame manufacturers create different engine plates that fit between the frame and the engine. This lets you bolt your choice of engine directly on while keeping the thrust line in the correct place. If there’s an engine plate already available for your chosen engine, things will be much simpler. If you choose an engine that isn’t catered for, the only option is to make your own engine plate; preferably from aluminium plate. With the sheer number of frame/engine combinations available it’s probably best to just find one that ticks all of your boxes rather than messing about making engine plates. For example my Parajet v3 is available with over 15 different engines so there’s one to suit everybody! If you buy a frame and motor as a package you will probably save a little over doing it separately. I hope this helps, good luck with your choice. Thanks for the info without any bias lean. I really appreciate you not interjecting any BS into it. As some looking to start learning the sport it was very helpful. I have decided to definitely get lessons and buy new equipment. I’ve decided not to add any unknown risks of buying used equipment. From all the BS I’ve read I’ve decided to take lessons then buy equipment most likely from the instructor because he’s been very transparent. He’s also willing to start training me remotely and use his equipment to learn when I make my 3 hour drive for weekend flight lessons. Thank you for all of the information. I have always wanted to fly planes but could never afford to take lessons. One day while driving, my daughter yelled “look daddy” pointing to the sky. Someone was in a paramotor not more than a few hundred feet off of the ground. We drove slowly rolling down the windows to hear the sounds it made. This was only 10 miles from my house, I have never seen it again or been able to find this person. There are no groups in my area. Frustrating to say the least. Glad I found your site. I am bookmarking everything! Hey James, thanks for checking out the site! I’ve had the same problems with no local pilots, and 95% of my flights have been by myself. This doesn’t make it any less enjoyable, but if you do get lonely a quick post on some of the big Facebook groups usually reveals pilots fairly close to you that you weren’t aware of. I also travel to fly-ins a few times each year, this is a great way of meeting fellow pilots who will be interested in meeting up. Good luck with your research into the sport, I hope you get to fly soon!